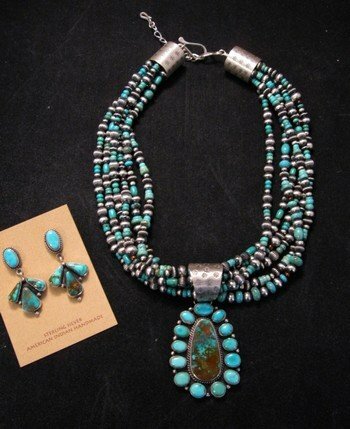 Up for your consideration is this brand new Native American ~ Navajo ~ handmade sterling silver and genuine Roston turquoise necklace & earring set by La Rose Ganadonegro and Marylin Platero. The perfect gift for any woman! 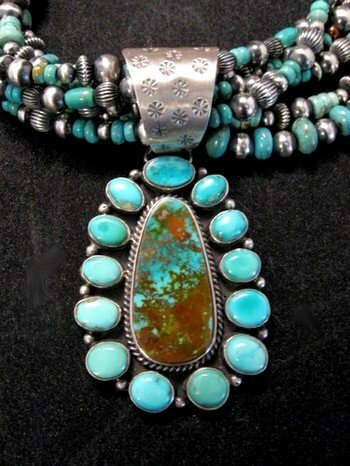 This lovely Navajo necklace features a natural Royston turquoise cluster pendant hung from a great mix of Sterling Silver Beads and Kingman turquoise beads. This necklace is finished with handmade sterling cones with floral stampwork. The necklace consists of six strands of multi sized smooth and corrugated beads mixed with turquoise beads. It measures 18-1/4 inches long. Plus there is a 3 inch silver chain necklace extender. Making it a possible 21-1/4 inches long. 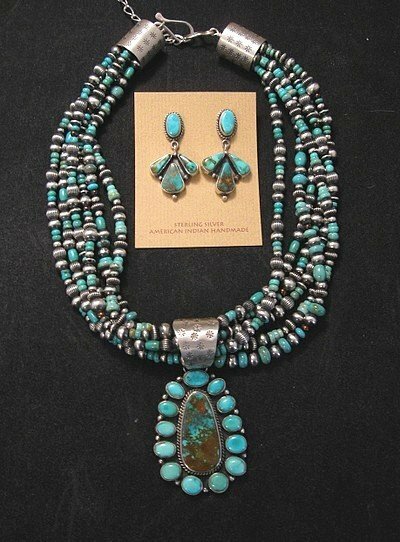 The turquoise & silver beads are made by Marylin Platereo while the pendant, earrings and the silver cones on the beads were made by Navajo La Rose Ganadonegro. The big Royston turquoise cluster pendant measures about 2-1/8 inch long by 1-1/2 inch wide at the widest point and weighs about 40 grams. This pendant has a delightful large bail with floral stampwork. matching the cones on the necklace. 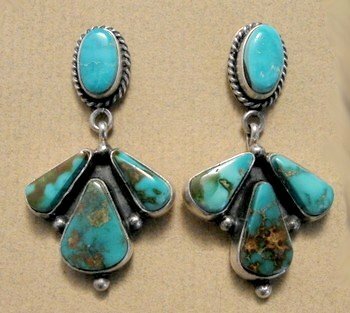 The matching earrings measure about 1-3/4 inches long. Brand new and in perfect condition. Gift box and Certificate of Authenticity included with your purchase. All silver work was created and hallmarked by the Navajo silversmith, La Rose Ganadonegro. La Rose Ganadonegro was born in 1956 in Crown Point, New Mexico. La Rose started silver work in 1984. La Rose works along side her husband Archie. 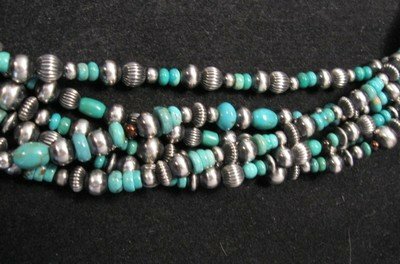 The 6 strand turquoise & silver beaded necklace has a combination of machine-made round beads and fluted beads, hand soldered, finished and strung by Navajo Marilyn Platero and finished with an oxidized or antiqued brushed satin finish that gives them a subdued, rich tone. 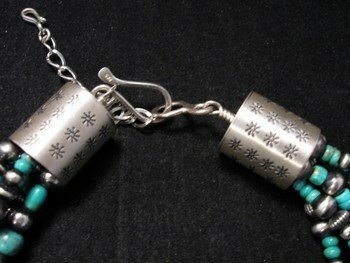 Different shaped turquoise beads are interspersed among the silver beads.